Prostate cancer is the most frequently diagnosed cancer in men in 105 countries. Prostate cancer patients usually present with lower urinary tract symptoms (LUTSs). It commonly metastasizes to regional pelvic lymph nodes and bones. Metastases to visceral organs are relatively rare, particularly in the absence of lymph nodal and bone metastases. If a patient presents with symptoms related to metastatic sites or other comorbidities in the absence of LUTS, this may lead to misdiagnosis. We present a case with space-occupying lesion in cirrhotic liver, diagnosed as hepatocellular carcinoma (HCC) on immunohistochemistry (IHC), who underwent F-18 fluorodeoxyglucose positron emission tomography/computed tomography (FDG PET/CT) and showed FDG-avid lesions in liver as well as in the prostate. These findings guided in establishing the diagnosis of prostate cancer, metastasizing to liver by performing additional immunohistochemical markers. PET/CT was also useful in identifying coexisting non-Hodgkin's lymphoma. A 77-year-old male presented with vague abdominal pain. CT scan of abdomen showed cirrhotic liver with hypodense lesion in the right lobe and right pleural effusion. The possibility of HCC was considered and serum alpha-fetoprotein level was not raised (3.3 ng/ml). FNAC from liver lesion showed carcinomatous cells [Figure 1]a and [Figure 1]b and IHC showed positivity for cytokeratin, arginase, and glutamine synthetase; weak positivity for hepatocyte antibody [Figure 1]c; and negativity for vimentin, and inhibin, consistent with HCC. However, in view of weak positivity for hepatocyte antibody, correlation with imaging findings were suggested. 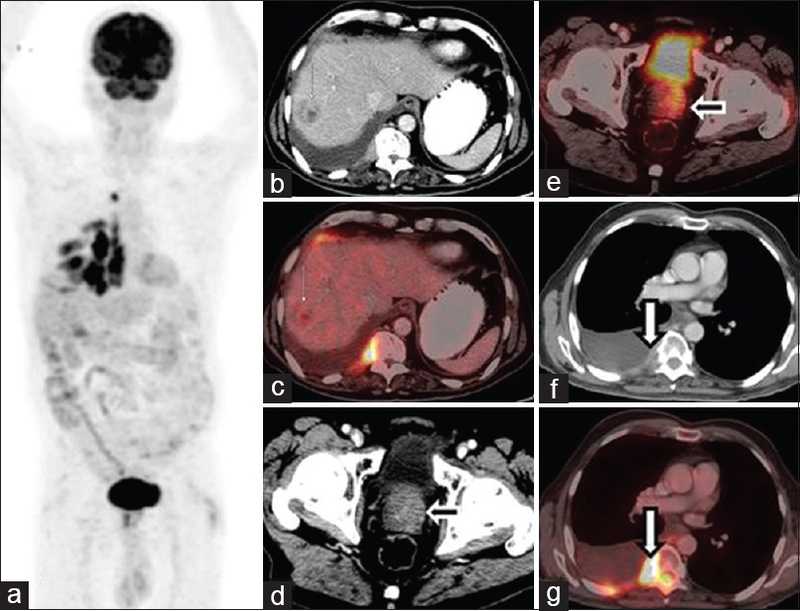 Hence, the patient was referred for F-18 FDG PET/CT [[Figure 2]a; maximum intensity projection image] and it revealed cirrhotic liver, with a lesion in right lobe showing low FDG uptake [[Figure 2]b and [Figure 2]c; thin arrows]. Increased FDG uptake was also seen in the left half and median lobe of prostate gland showing mild heterogeneous enhancement [[Figure 2]d and [Figure 2]e; black arrows]. In addition, intensely FDG-avid soft-tissue deposits were noted in intraspinal extradural location at level of D5–D8 vertebrae, right paravertebral region, and along adjoining right-sided lower ribs/pleura [[Figure 2]f and [Figure 2]g; white arrows] as well as right pleural effusion. Possibility of coexisting prostate cancer was also considered and further evaluation was suggested for intraspinal/paravertebral deposits. Serum prostate-specific antigen (PSA) was elevated (82.6 ng/ml) and biopsy from prostate showed adenocarcinoma prostate with Gleason score of 4 + 5 = 9 [Figure 3]a and [Figure 3]b. 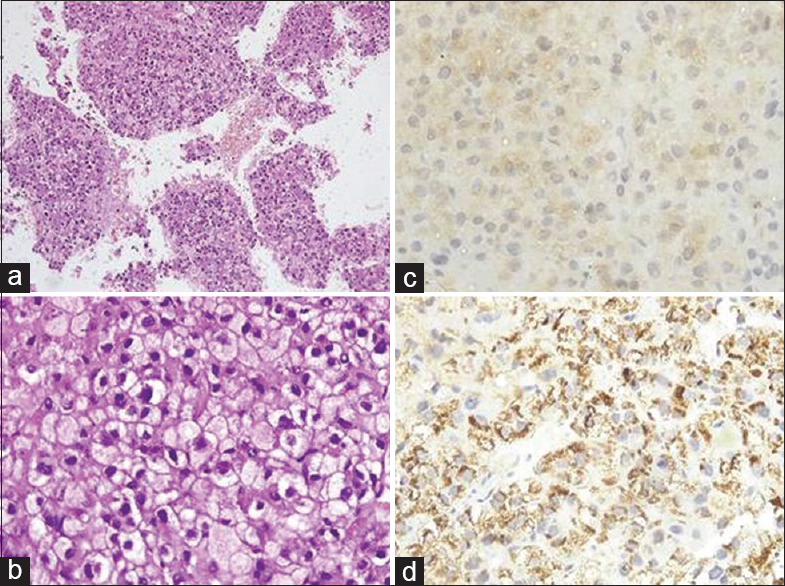 Since the liver lesion showed only weak positivity for hepatocyte antibody, additional prostate-specific IHC markers were performed on cell block from the liver lesion, which showed P504S positivity [Figure 1]d, consistent with metastases from prostate cancer. Meanwhile, the patient developed difficulty in walking. Magnetic resonance imaging spine showed elliptical T2 intermediate signal and a mildly enhancing extradural lesion in the posterior aspect of thoracic spinal canal extending from D5 to D9 level, suggestive of metastatic deposit. However, in view of different metabolic signature on FDG PET/CT (intense FDG uptake in intraspinal and paravertebral soft tissue versus low-to-moderate grade FDG uptake in liver and prostate lesions), trucut biopsy from paravertebral soft tissue was performed, which showed lymphoid cells [Figure 3]c and positivity for CD 20 [Figure 3]d, CD 10, bcl 2, and leukocyte common antigen, consistent with non-Hodgkin's lymphoma. Prostate cancer is the most frequently diagnosed cancer in men in 105 countries. Most of them present with LUTS and a significant number of prostate cancer patients have metastases at the time of diagnosis or during the disease course. Apart from regional lymph nodes, it most commonly metastasizes to bone (84%), followed by relatively low incidence in other sites such as distant lymph nodes (10.6%), liver (10.2%), thorax (9.1%), brain (3.1%), digestive system (2.7%), retroperitoneum (1.8%), and kidney and adrenal gland (1%). Whenever patients present with symptoms related to metastatic sites or other comorbidities in the absence of LUTS, this may lead to misdiagnosis. In our case, the prostatic lesion was not evident on initial CT abdomen and weak positivity for hepatocyte antibody on IHC in a lesion from cirrhotic liver led to the initial diagnosis of HCC. Even though F-18 FDG is not an ideal tracer to image prostate cancer, it outperforms CT in detecting unsuspected primary and metastatic prostate cancer, particularly in patients with aggressive histology and high serum PSA level. This may be due to whole-body imaging and ability to provide additional functional information. In our case, identification of FDG-avid prostatic lesion not only helped in diagnosing prostate cancer but also guided in incorporating additional prostate-specific IHC markers and proved liver lesion as metastasis from prostate cancer. Hepatocyte antibody, an IHC marker, is very useful in diagnosing HCC. However, its positivity has been reported in other tissues like small intestinal goblet cells as well as in few cancers such as lung, prostate, and adrenal carcinoma.,, Hence, if there is any another known or suspicious primary malignancy on imaging, appropriate additional IHC markers should be included to rule out the possibility of metastases, even if the liver lesion is positive for hepatocyte antibody (particularly if weakly positive as in this case). In our case, liver lesion showed positivity for P504S/α-methylacyl CoA racemase, which is a relatively new highly sensitive and specific marker for prostate cancer, thereby confirming the diagnosis of prostatic cancer metastasis., In addition, cells from liver lesion showed similar vacuolated cytoplasm as seen in cells from prostate biopsy on microscopic examination, which also supports possible metastatic nature of liver lesion. F-18 FDG PET/CT was also useful in demonstrating additional coexisting lymphoma in the intraspinal and paravertebral regions and reiterates the fact that if findings are atypical and show different metabolic signature, tissue diagnosis from various sites is essential. 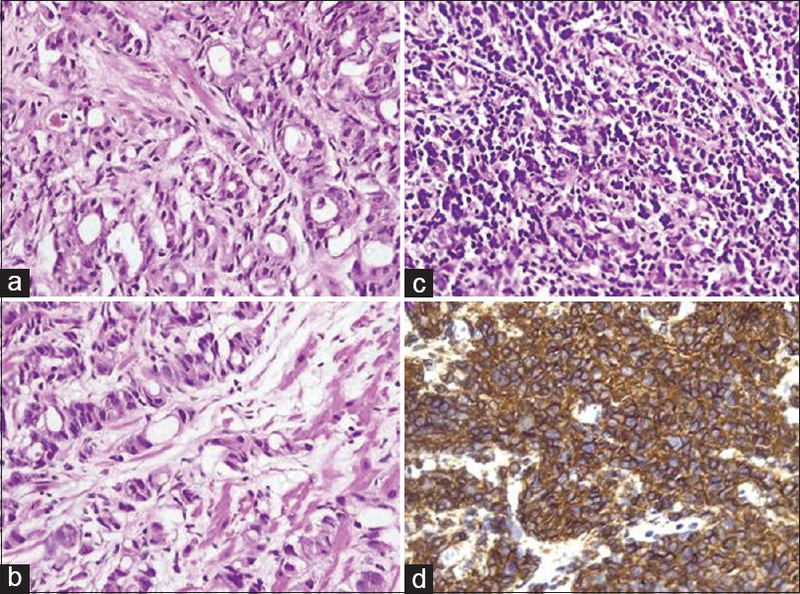 This case emphasizes the importance of whole-body F-18 FDG PET/CT and incorporation of appropriate IHC marker based on imaging findings to obtain the correct diagnosis. Bray F, Ferlay J, Soerjomataram I, Siegel RL, Torre LA, Jemal A. Global cancer statistics 2018: GLOBOCAN estimates of incidence and mortality worldwide for 36 cancers in 185 countries. CA Cancer J Clin 2018. doi: 10.3322/caac.21492. Gandaglia G, Abdollah F, Schiffmann J, Trudeau V, Shariat SF, Kim SP, et al. Distribution of metastatic sites in patients with prostate cancer: A population-based analysis. Prostate 2014;74:210-6. Jadvar H. Is there use for FDG-PET in prostate cancer? Semin Nucl Med 2016;46:502-6. Chu PG, Ishizawa S, Wu E, Weiss LM. Hepatocyte antigen as a marker of hepatocellular carcinoma: An immunohistochemical comparison to carcinoembryonic antigen, CD10, and alpha-fetoprotein. Am J Surg Pathol 2002;26:978-88. Chu PG, Jiang Z, Weiss LM. Hepatocyte antigen as a marker of intestinal metaplasia. Am J Surg Pathol 2003;27:952-9. Giedl J, Büttner-Herold M, Wach S, Wullich B, Hartmann A, Agaimy A et al. Hepatocyte differentiation markers in adenocarcinoma of the prostate: Hepatocyte paraffin 1 but not arginase-1 is specifically expressed in a subset of prostatic adenocarcinoma. Hum Pathol 2016;55:101-7. Jiang Z, Woda BA, Rock KL, Xu Y, Savas L, Khan A, et al. P504S: A new molecular marker for the detection of prostate carcinoma. Am J Surg Pathol 2001;25:1397-404.